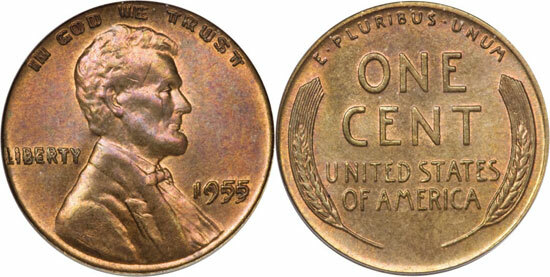 The 1955 Doubled Die Lincoln Cent is a famous and popular die variety of the Lincoln Cent series. Struck from a single die pair during a single day, it is one of the most strongly doubled dies to have occurred within American numismatics, with the doubling plainly visible even without magnification. Due to the limited number of examples struck and the dramatic appearance, examples are highly valued and eagerly sought by collectors. Doubled Dies, as they are called in numismatics, are created when coinage dies are made from the hubs featuring the design of the coin. To make sure all details of the coin design are impressed into the working die, multiple impressions are necessary. Usually, the hub does not shift between the impressions on the die, but occasionally this does happen. When this occurs some of the lettering, devices or both will appear doubled, with the second impression being removed from the first impression. Some spreads are very small, and only noticeable under magnification. Others, such as the 1955 Doubled Die Lincoln Cent, are easily recognizable, thanks to the wide spread that was created when the hub shifted between the first and second impression of the working die. It is generally assumed that the 1955 Doubled Die cents were all struck in a single day, during a period when there was a shortage of circulating cents and the Mint was having a difficult time keeping up with demand. On that particular day, several presses were striking cents which were all dumped into a single box. A mint inspector had noticed the unusual appearance of some of the cents mixed into the box, but they were released into circulation since it was deemed impractical to melt the entire lot due to a small number of defective pieces. During the next few months the error coins turned up across the Atlantic seaboard, with the first example discovered in Massachusetts in the fall of 1955. Gradually more examples were discovered. An important source was cigarette packs, which cost 23 cents a pack at the time. Since the machines which dispensed them could not refund the change, two cents were pasted on or placed inside the cigarette pack. Research has proven that these cigarette packs constituted a primary source for the doubled die cents. It is generally assumed that all 1955 Doubled Die Lincoln Cents were produced during a single day at the Philadelphia Mint. According to most sources, approximately 20,000 to 24,000 1955 Doubled Die Lincoln Cents were released into circulation within a batch of approximately 10 million newly struck cents. This is just a tiny fraction of the total mintage of Philadelphia cents of this year, which reached 330 million pieces, a relatively high number but only about half of the highest mintage that was achieved during the decade. From the original mintage of doubled die cents, only a portion survived for later generations of collectors. As basically the whole mintage went into circulation, and given the fact that it took a while for the variety to be noted by the general public, it can be practically assumed that many must have been lost over the months and years after their mintage. From auction appearances and the general availability of the 1955 Doubled Die Lincoln Cents, modern sources usually quote a number of approximately 12,000 to 15,000 examples that are still believed to exist in all grades. The available supply has been met with constant demand from collectors. Most examples that come on the market are quickly bought and placed into collections where they often remain for many years. The 1955 Doubled Die Lincoln Cent is a true rarity in gem condition, as basically all examples were quietly released into circulation, where they had to be retracted by the conscientious public. As such, there is a wide spread in both the certified population numbers and the values between the relatively common circulated examples and uncirculated examples, especially those with original Mint red coloration. The scarcity of examples with original red coloration is due in part to the original distribution of many pieces within cigarette packs, which contained chemicals that tended to tone freshly minted copper coins. The finest known Red examples that have been certified by PCGS are 18 MS-65RD’s, a number which appears to be at least slightly influenced by resubmissions. MS-64RD’s are more available, with 140 examples graded by PCGS, but perhaps only 100 examples really exist, with the others being resubmissions as well. NGC, the other major grading service, has graded a single example as MS-66RD, the absolute finest known. Additionally, four examples have been graded in MS-65RD by that company. In Red-Brown, PCGS has graded 5 examples in MS-65RB, with 179 in MS-64RB. These are not as difficult to find as RD examples but remain sufficiently scarce. NGC has graded a single MS-66RB, with an additional thirteen MS-65RB’s graded. In Brown, the most available color designation for this popular variety, PCGS has graded 6 MS-65BN’s, with 183 examples graded one grade lower. Most uncirculated 1955 Doubled Die Lincoln Cents are graded MS-63BN, with a total of 368 examples graded by PCGS. Again, these numbers no doubt include some resubmissions, but judging by the number of auction appearances these appear relatively close to correct. 12 MS-65BN’s have been graded by NGC. As can be derived from the populations in MS-65, regardless of color designation, this coin is very difficult to find in gem. The finest known MS-66RD, graded by NGC, sold for $50,019 in 2006, and the few PCGS MS-65RD’s that have recently been auctioned have already topped that amount, with one of the selling for an amazing $59,225 as far back as 2001, while recent sales have been around the $50,000 level. Red-Brown and Brown designated examples are more available, although gem Red-Brown examples still carry a price tag of approximately $15,000 or more. Nice circulated examples of the coin are relatively more affordable, with nice examples available for around $2,000 or less.